After realizing that I had a stack of itty bitty appointment cards floating around in my purse and no closer to remembering which appointments were when, I went on a search for an agenda in July. I wasn’t too picky but felt I simply couldn’t do the standard stationary store variety with pictures of fruit or small animals. And it couldn’t be so heavy that it weighs down my already tweaked body. In the end, I made myself a quickie version that would suffice. Enter by Veekee. Literally. 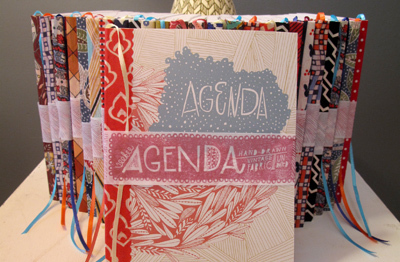 Vikki Wierzinski entered my store the other day with an offer to carry her handmade agendas. The by Veekee agendas are the pretty agendas I have ever seen. Vikki is a typographer and graphic based artist with a keen sense of colour and texture so believe you me these babies are gorgeous. And seriously practical – they are “undated” and have a “notes” section. Oh yeah! And a page of adorable stickers! If you have a busy, stylish paper loving person on your holiday gift list, this is a great gift idea.